Fineline Construction has many clients in the Fort Mill, SC area, which is located along the I-77 corridor in the northernmost part of South Carolina. With school systems among the best in the state and Fort Mill being home to a number of thriving businesses and corporate offices, it’s no wonder this small town is one of the fastest growing communities in the greater Charlotte area. To learn more about the Easterling’s porch addition and other Fort Mill residents who rave about working with us, click here. 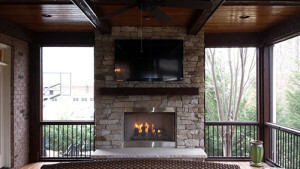 In addition to serving Fort Mill, Fineline Construction is proud to offer other remodeling services such as home additions, basement finishing, custom decks, patios, covered porches and more in the greater Charlotte area, including Davidson, Huntersville, Mooresville, Cornelius and Denver.